In Search of a Maltese Identity: Announcement - New Project Friend! Project Friend Number 9 - Joe Gerada. My father has been an unofficial project friend since our map conversation in December. I have decided to make it official because his contributions have become key to the project. 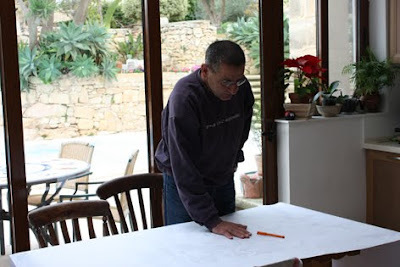 He drew the South of Malta, including Birzebbuga the village he grew up in - which eventually became my site. He explained the historical, social, economic factors that have shaped and changed this area and the reasons why it is so separate from the rest of Malta. In doing so he painted a layered picture of a place shaped more by outsiders than by its inhabitants, and a place that is still going through much change even now. Lately he is one of the people I find most helpful in answering almost any type of question I have on Malta, be it architectural, social, historical, economic or completely random.